Capital of Hungary, with almost two million inhabitants, centre of administration, industry, trade, transport and traffic, education, culture, arts and sports. The most attractive target for tourism. It is situated on both banks of the Danube. Altitude of the bank of Pest is 100-150 m above sea level; peak elevation of the hills of Buda is 529 m.
Buda, Pest and Óbuda (Old Buda) were united in 1872 and further settlements (Újpest, Kispest, Nagytétény) were joined in 1950 making Great Budapest expand on an area of 525 km2. It is a beautifully situated city. The Buda Mountains mainly consist of limestone and dolomite formations, rich in karst waters and caves. Karst water springs break out almost along the whole river bank. Thermal waters gave rise to the world-famous bathing resort inaugurated by ancient Romans and developed especially by the Turkish occupants of Hungary in the 16-17th centuries. Of the capital cities of the world Budapest is the richest in baths (Gellért, Rudas, Rác, Lukács, Széchenyi, Margitszigeti Thermal and Király Fürdő). Six major islands belong to Budapest: Margit-sziget, Óbudai and Csepel-sziget, Palotai, Nép- and Háros-sziget. Of these the one most endowed with historic monuments is the Margit-sziget, originally consisting of several eyots but united when the Danube was controlled. To ancient Roman buildings several others were added in the 13th century: the Saint Michael monastery of the Premonstratensians and a Dominican cloister, where the daughter of King Béla IV, Saint Margit retired. These buildings were destroyed under the Turkish rule. The island is a popular resting place, owing to its special geographical features, sports grounds, baths and entertainment facilities. At both ends, the island, Buda and Pest are connected by bridges (Margit híd and Árpád híd). In addition to them there are seven more bridges in Budapest over the Danube (north railway bridge, Lánchíd (Chain-bridge), Erzsébet híd (Elisabeth-bridge), Szabadság híd (Liberty-bridge), Petőfi híd (-bridge), bridge of Lágymányos and the south railway bridge). Budapest's architectural heritage can be traced back to late antiquity. The remains of Aquincum were found at Óbuda. On the site of Flórián square was the legionary camp and from the 13th century, a royal castle, later used as the queen's residence was situated. The ancient civilian town was built near the existing road to Szentendre (Szentendrei út). Of the ruins and mosaics of nearby villas the "Hercules villa" can be visited (Meggyfa street 19-21). Pest and Buda were developed to become towns in the 12th-13th centuries, when the centre was Óbuda. After the withdrawal of the Mongolian invaders in 1242, the Castle Hill (Várhegy) begun to be settled. Of the southern part of the 14th century castle the foundations of the István tower can still be seen. The royal court was transferred from Visegrád to Buda by King Louis the Great in 1347 and then the almost two-century-long construction works of palace and its fortifications begun. King Sigismund's richly ornamented palace was built in the Gothic style. His "Fresh Palace" and the court of honour with arcades were ready before 1419. Matthias Corvinus was elected king in 1458 and he erected his famous magnificent residence, representing his wealth, well-organised army and centralised power. His court gave home to humanist culture. In 1526, the palace was plundered by the Turks and the treasures removed. In 1541, Buda was again taken by the Turks. During their reign, lasting 150 years this time, mainly fortifications were constructed and the palace begun to decay. The powder-magazine exploded, fires ravaged. In 1686, Buda was liberated. Under Maria Theresa's reign, further to the claim of Hungarian estates, the existing palace was constructed (1749-1770) as the seat of the palatine. In 1806, the Palace Sándor (Sándor-palota) was built. In the 1848-49 War of Independence the castle was heavily damaged again. Reconstruction begun after the Compromise of 1867 in 1881 when an imposing cupola was built. In World War II, both the edifice and its complete furnishings were destroyed. Renovations were preceded by archaeological research. Today it is the most significant cultural centre of Budapest housing the Budapest History Museum, the Hungarian National Gallery, a section of the Hungarian National Museum, i. e. the Museum of Contemporary History and the National Széchenyi Library. The construction of the Our Lady Church, called lately Matthias Church, begun in 1250 and went on for 20 years. In 1309, King Charles Robert was crowned here. The portal with the death of Mary was a gift of King Louis the Great. King Sigismund received the Byzantine Emperor here in 1424. Around 1460 King Matthias had an oratory constructed and later on his marriage was celebrated here. In 1541 it was devastated by the Turks. First, in 1686, Franciscans and then Jesuits were installed here. The present appearance of the Matthias Church is due to reconstruction according to plans by Frigyes Schulek. The commanding view is enhanced by the picturesque Halászbástya (Fisherman's Bastion) built in 1901 in neo-Romanesque style. In 1839, on the initiative of Count István Széchenyi, constructions led by Adam Clark begun according to plans by Tierney William Clark. It was completed in 10 years. In 1857, the Tunnel and in 1870, the Cable Car were added. The Chain Bridge was exploded in World War II by the retreating German military and reconstructed for the centenary of its inauguration, 21st November 1949. By the second half of the 13th century, Pest became a notable and wealthy town. There were a royal house and a parish church and, in addition, since 1233, a Dominican cloister within the city walls. After the retirement of Mongol invaders only ruins remained, but public security was reestablished by King Béla IV and reconstruction took place. The clauses of the letters-patent of the settlers of Pest were renewed and burgesses were allowed to acquire properties. After the Turkish rule, reconstruction was equally a major necessity. The first significant edifice, the Palace of Invalids (Városház utca 9-11.) was built from 1716, however, only three wings were completed. The Inner City Parish Church (1725-1739), baroque, on the foundations of the former Romanesque church integrating ruined Gothic walls), the Servite Church (1725) and the Clarisse nunnery (1729), the Franciscan monastery and church (on Ferenciek Square, 1727-1743), the Pauline monastery and church (now University Church) were erected. In the first decades of the 18th century, the Town Hall was built. Pest became an economic and cultural centre by the early days of the 19th century. In 1808, the Embellishment Plan was accepted by the King, allowing large-scale city planning, canalisation, road construction, demolition, parcelling out lots. Public gardens and parks, like the Orczy Garden, then in 1817 Városliget (City Park, formerly called Városerdő, City Wood), which was the first planned public park of the world) and Népliget (Public Park, the largest park in Pest) were opened. The Inner City became a civic, ecclesiastical and educational centre, the Lipótváros district specialized in economy. Other districts like Teréz-, Ferenc- and Józsefváros were in bustling development too. Megyeháza (County Hall) was constructed (neo-Classical, 1804), but in its present form it was not completed before the years 1838-1841. Most Turkish buildings disappeared during the reconstruction works in the 18th century, ruins and remains were integrated into Baroque houses, producing a unified Baroque cityscape. In the XIXth century neo-Classical style was predominant, of which outstanding monuments are the Ludovika (Military Academy), the Lutheran Church on Deák Square, the Calvinist Church on Kálvin Square (1816-1830) and the National Museum of Hungary. The core of the collection was donated by Ferenc Széchenyi, István Széchenyi's father, in 1808. It is a two-storied building and was completed from 1837 to 1848). The tympanum above the colonnade of the entrance is decorated with allegoric figures. The vestibule communicates with the hall under the dome and the staircase. The ceiling and the side walls have been frescoed by Károly Lotz and Mór Than. The Saint Stephen's Basilica (neo-Classical and neo-Renaissance) is an outstanding edifice in the district of Lipótváros. It was constructed initially according to plans by József Hild in 1847, but after his death, Miklós Ybl continued, who suggested a prompt revision of the plan for the dome, which, however, collapsed in 1868. Further modifications followed and it was completed in 1890 according to plans by József Kauser (96 m height). In the years from 1858 to 1865, the Vigadó (Municipal Concert Hall) was built according to plans by Frigyes Feszl, on the place of the Redoute and the German Theatre. In World War II it was damaged and later partially reconstructed. The Synagogue in Dohány utca (romantic, Byzantine Moorish, 1854-1859) is the biggest one in the world (with a Jewish Museum). Their reconstruction works have recently been finished. The edifice of the Hungarian Academy of Sciences (neo-Renaissance, 1862-1864) is by Stüler, architect from Berlin. Opera House, the biggest theatre in Hungary, is a beautiful building. The construction begun in autumn 1875 according to plans by Miklós Ybl in neo-Renaissance style and was finished in 1884. In the 1980's it was renovated. The ceiling fresco of the five-storeyed house was painted by Károly Lotz. This elegant, decorative architecture is Ybl's best work. The eclectic edifice of the Eötvös Loránd University of Sciences was built in 1882 by Imre Steindl. The railway station Budapest East (1884) is linked with the name of János Fekete. The construction of the Parliament begun in 1885, according to plans by Imre Steindl and it was finished in 1904. The main front overlooks the Danube. Through the main entrance, the "Lions'" door, a staircase frescoed by Károly Lotz, leads to the hall under the dome. To the right and to the left, two independent wings served the Upper House and the Lower House, respectively. The edifice is 168 m long, three-storeyed, with lacy towers and gigantic windows. The facade is decorated with 88 sculptures. 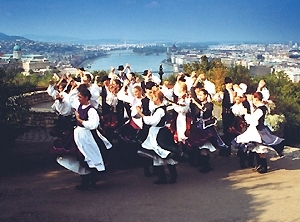 It is the centre of the state life of Hungary. Here are exhibited the royal insignia received back in 1978 from The United States of America. The Industrial Arts' Museum, a three-storeyed secessionist edifice with characteristic Hungarian pyrogranite decoration was built from 1893 to 1896 according to plans by Ödön Lechner and Gyula Pártos. The Museum of Ethnography, originally High Court of Justice, an eclectic palace was built in 1896-97 according to plans by Alajos Hauszmann. For the millennium of Hungary, the first underground railway was opened in mainland Europe under Sugár-út (Avenue), lined with elegant, multi-storey buildings. Block-wood pavement was provided as the road surface above the tunnel. It was Count Gyula Andrássy's suggestion to construct an Avenue, hence it is called today Andrássy út. The Monument of the Millennium of Hungary, with statues of eminent Hungarians, is on Hősök tere (Heroes' Square) closing the outer end of the Avenue. Both Műcsarnok (Art Gallery, 1895) on the right and the facing Szépművészeti Múzeum (Museum of Fine Arts, 1900-1906) were planned by Albert Schikedanz and Fülöp Herzog. The square is actually the entrance to Városliget (City Park), with the nearby Castle of Vajdahunyad, constructed by Ignác Alpár in 1896, but built again, now of more lasting materials, between 1904 and 1908. It is a presentation of details of architectural monuments and illustration of styles of the historic Hungary and could rightly be called a museum of architecture and of history of styles. However, it is named after the main pattern borrowed from the castle of Vajdahunyad in Transylvania and houses the Museum of Agriculture. In 1866, a zoological and botanical garden was established in the Park for which the pavilions by Károly Kós and Dezső Zrumeczky were completed by 1910. The restaurant Gundel, fun fair, Széchenyi bath, esplanades, giant trees, lake, in winter artificial skating rink, offer facilities for pleasant leisure. It is impossible to list all sights in our beautiful capital. This selection was intended only to induce interested readers to visit them. Józsefváros, one of the oldest districts of Budapest, has just celebrated its 225th anniversary. It has over 80.000 inhabitants. On the request of the citizens, it was named after Joseph II, heir to the throne. The dynamic development of the district started in the 1800s. The National theatre was built in 1837, the National Museum - in 1847, the old house of representatives - in 1865. The magnates and rich citizens built elegant council houses and the inner Józsefváros, the palace district was formed in the territory reaching as far as the present József Boulevard. After the flood of Pest in 1838, the middle part of the district was rebuilt, where most of the lower middle class and craftsmen lived. The poor lived in the territory reaching as far as Orczy road. You can find innumerable wonderful buildings here. (Wenckheim Palace, Esterházy Palace etc.) The pearls of the town are the Füvészkert (Arboretum) and the Orczy-garden. The clinics have been the centres for medical education and curing for more than a hundred years. You can find Technical Colleges bearing the names of Kálmán Kandó and Donát Bánki here. The Mihály Fazekas Training Elementary and Grammar School is situated here, where several famous people studied. The cultural life is colourful in the district. The block rehabilitation of the 9ha territory between the Corvin cinema and Szigony street is providing a new direction in its development. A residential area is to be built here with pedestrian streets, a brook and parks. This project is a good example of harmonious combining of the values of the past with new, modern ideas. Ferencváros is the old-new name of the 9th district of Budapest. This part of the town built outside the town gates of Pest was given this name in 1792 on the occasion of Ferenc I's coming to the throne. In 1879 Pest, Buda and Óbuda were united, and among the districts of the new town called Budapest this part was given number 9. At that time the territory of the district was the same size as today. Üllői road and Soroksári road ( and the bank of the Danube), the two 'radii' of the typical structure of the capital with radiating and ring roads, border the district and moving outwards the units divided by the rings show less and less of the characteristics of a town. Inner-Ferencváros, the part between Vámház boulevard and Ferenc Boulevard is the oldest and the most urban part of the district. The area between Ferenc boulevard and Haller street is called Middle-Ferencváros. Haller street used to be the border of the town as well as the protection line against floods, while the area between Soroksári road and Vágóhíd street was mainly an agricultural and industrial part with mills and dwelling houses. In Outer-Ferencváros you can find Attila József housing estate, which is one of the oldest and friendliest ones in the capital. Main sights: the Church of the Parish of Ferencváros in Bakáts square, the Museum of Applied Arts, the Calvinist Church in Kálvin square, the Great Market hall, the National Theatre, the Church of Perpetual Adoration, the synagogue in Páva street, Ráday street, St. Cirill and Metod Church of the Eastern Church, St. Vincent parish church, Holocaust Memorial Centre.